Zipper flowers are so quick and easy to whip up and they made a sweet bouquet. 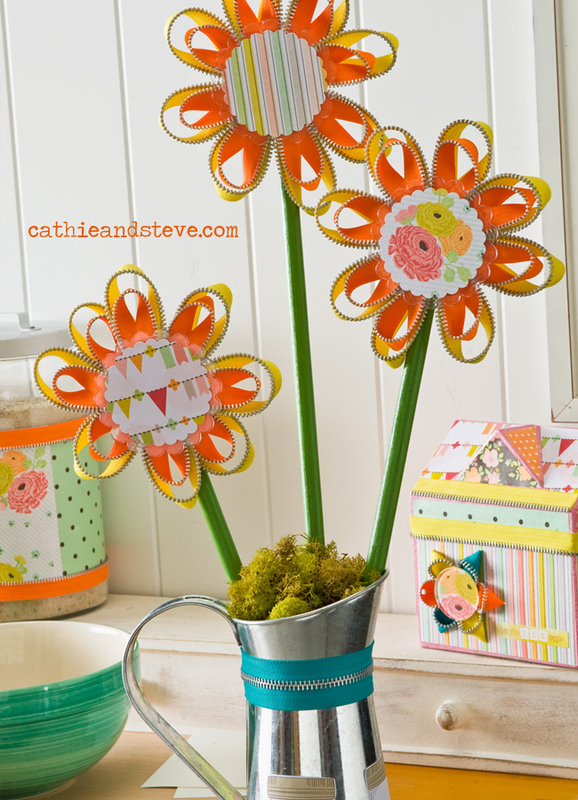 These flowers were made with Mod Podge, Large Podgeable Shapes, Zippers and Wood Dowels. This was designed for Plaid using our Products for Mod Podge. View the complete instructions here! I have tons of different Zippers at the supply shop......Visit the Cathie Filian Shop Here. FolkArt ® Shiny™ Acrylic Paint - Grass Green, 2 oz. 1. Cut designs from scrapbook paper that will fit onto the tin pitcher. Apply the paper to the tin pitcher with Mod Podge. Do this by applying Mod Podge to the back of the paper. Position the paper onto the tin pitcher. Smooth with a brayer or your fingers to remove any air bubbles. Wait 15 minutes and top-coat with a layer of Mod Podge. 2. 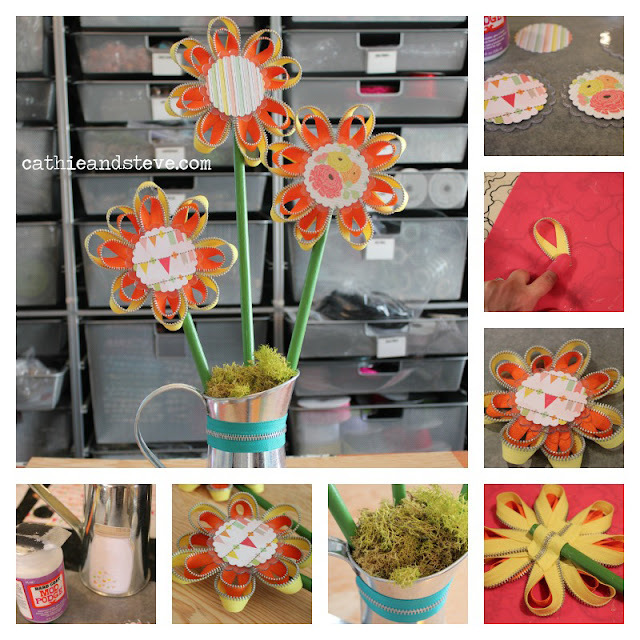 Make the flower stems: Cut the dowel rod to different lengths. Paint the rods with Grass Green paint. Paint two coats with dry time in between. 3. Make the flower center: Mod Podge a circle of paper to the top of a Podgeable Scalloped Circle. 4. Make the flower petals: For each flower, cut the yellow zipper trim into eight 6” pieces and the orange zipper into eight 5” pieces. 5. Bend the zipper trim to form a loop (petal) and hot glue the ends together. Repeat with the remaining zipper pieces. Layer the orange petals inside the yellow ones and hot glue to secure. 6. Hot glue the zipper petals to the back of the Podgeable Circle. Make sure you wear Hot Glue Finger Caps when hot gluing. 7. Hot glue the flowers to the ends of the stems. Hot glue a strip of zipper trim over the end of the stem to secure. 8. Hot glue a strip of teal zipper trim around the tin vase. Place the flowers into the vase and stuff the vase with plastic bags to secure. Top the vase with moss.